So simple, so silly, and so fun. Such perfect page turns. Two friends, large (hearted), small (sized), ready to fly off into the big blue sky. 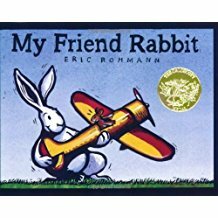 "My friend rabbit means well," says Mouse. "But whatever he does, wherever he goes…,"
Turn the page dear reader. Keep that sentence in mind. And this sentence: "Not to worry Mouse. I’ve got an idea." Sandwiched in between are the wonderfully vivid, brilliantly expressive images that carry the story. The illustrations do the heavy lifting, adroitly reminding us that we are reading a Picture Book. Rabbit, pulling the massive pachyderm by its tail, pushing the two-horned rhino, carrying the blissful hippo! Pay attention to the variety of emotions diplayed on that amazing two-page spread. Rabbit so busy – hoist, carry, deposit. Repeat. Hoist, carry, deposit. Whew! Squished down by the weight of the animal, soldering on regardless. Because Rabbit has "an idea." And then, hmm, Rabbit looks taller doesn't he? For now he is carrying feather light Mama Duck. The ducklings follow, but wait a minute. Is that our friend Mouse amidst the ducklings? A read-aloud par excellence, where the youngest reader would 'read' the pictures, learn the words along the way and say at the end "Let's read it again".